Risk maps summarizing landscape suitability of novel areas for invading species can be valuable tools for preventing species’ invasions or controlling their spread, but methods employed for development of such maps remain variable and unstandardized. We discuss several considerations in development of such models, including types of distributional information that should be used, the nature of explanatory variables that should be incorporated, and caveats regarding model testing and evaluation. 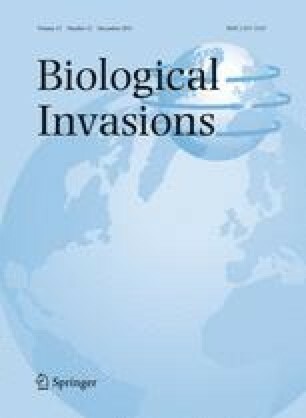 We highlight that, in the case of invasive species, such distributional predictions should aim to derive the best hypothesis of the potential distribution of the species by using (1) all distributional information available, including information from both the native range and other invaded regions; (2) predictors linked as directly as is feasible to the physiological requirements of the species; and (3) modelling procedures that carefully avoid overfitting to the training data. Finally, model testing and evaluation should focus on well-predicted presences, and less on efficient prediction of absences; a k-fold regional cross-validation test is discussed. This paper was supported by the Spanish MEC project CGL2004-0439/BOS, a Fundación BBVA Project, and the European Distributed Institute of Taxonomy (EDIT) project. AJ-V was supported by a MEC (Ministerio de Educación y Ciencia, Spain) postdoctoral fellowship (Ref. : EX-2007-0381) and the MEC Juan de la Cierva Program. ATP and JS were supported by a grant from Microsoft Research.